Every once in a while, a new voice emerges of which you instantly know it has the power to lift the medium to new heights and for the comics art form to gain recognition beyond the established circles. Michael Cho is that kind of voice. Born in South-Korea and moving across the Pacific Ocean to Canada at age six, Cho first made a name for himself outside of the main comics industry as an illustrator for Random House, The New Yorker, Penguin and other grand publications or publishing houses. Chances are you’ve seen his Golden Age variant cover for Superman Unchained #6 or his short story in 2013’s Batman: Black and White #1. But Michael Cho is about so much more than just capes and cowls. 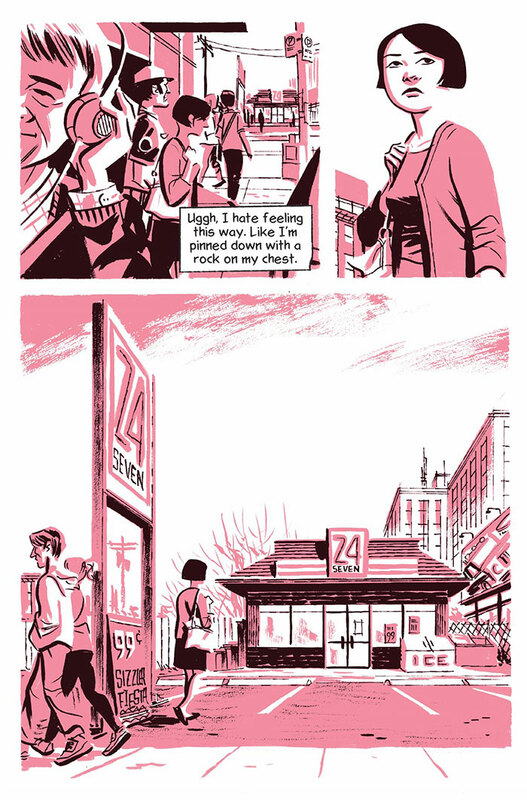 In Shoplifter, his first graphic novel out now from Pantheon/Jonathan Cape, he explores universal themes as consumer culture, isolated life in the big city and young adult growing pains in two-toned color. But don’t let the pink fool you, this is serious business. Your storytelling style has been compared to the likes of David Mazzucchelli and Adrian Tomine, but I also immediately saw some Darwyn Cooke in there as well. What do you think of these comparisons and how would you describe your style yourself? MICHAEL CHO: All three artists are exceptionally talented, so it’s flattering to be mentioned with them. However, I’m not really big on comparing myself to them or anyone else. 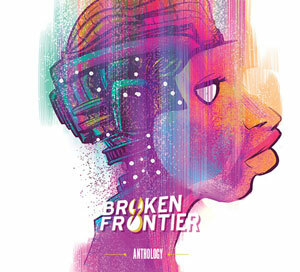 I’m familiar with and appreciate their work in different ways but I don’t derive my “style” from their work. Whatever similarities are superficial, I think. I suppose I might be more influenced by some of the artists that influenced them, as I draw my comic art influences from an older generation of creators from the 30s to the 60s. As for how to describe my “style”, I try to avoid getting hung up on it. Shoplifter was drawn in two-tone, with an emphasis on light and atmosphere. But I’ve done other work in full color and in completely different styles. I just draw in whatever manner best suits the feel of the story I’m telling. My illustration work, for example, uses a lot of different approaches. Working mainly as an illustrator before, how long had you been carrying around the itch to produce a true graphic novel? Forever. I’ve wanted to write and draw my own comics since I was a kid. When I was in my 20s, I started writing and trying to create comics of my own, but my craftsmanship was so poor that I couldn’t express some of the things I was interested in capturing in comics – things like atmosphere and mood. I put it on the back-burner and worked on refining my skills while doing illustration work for several years, but about 5 years ago that “itch” you described flared up and couldn’t be left in the background anymore. Plus, I thought I was ready now and able to do the job properly. 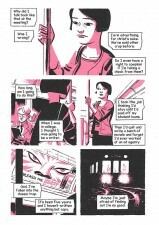 So I started planning a few graphic novel projects, of which Shoplifter was the first. I worked on Shoplifter in stages and spurts, on and off in between illustration and other work. For example, when I wrote a draft of the script, I put it away in a drawer for several months before I took it back out to see if it still “worked” when I read it fresh. And then I edited it and rewrote it quite a bit. The drawing of it was done in two stages too, in dedicated 3-month spurts. I was also looking after a young daughter at the time, so that also affected the process. I think if you took all the time and compiled it together, it might equal about a year of work time. What did you find the most arduous part of the whole process? Probably the writing. The drawing took longer, but the writing was harder. Especially since it was at the start of the project, and I had no previous experience working on something this big. So there were moments of self-doubt where I wondered if I knew what the hell I was doing, if it would work out at all or what to put in or take out. It got easier as I got to the mid-point of drawing the book, as I could start to see the book take shape. Although your protagonist, Corrina, is a woman, do the main themes you explore – the isolation of a big city and finding your place in life as a twenty-something – ring close to home? I think so. I knew when I was writing it that it’s a fairly universal story – the search for identity and your place in life. And while I’m not Corrina, I think most writers put something of themselves in their characters. I certainly experienced what she felt in my 20s. There was a feeling of drifting that I felt back then and a feeling of waiting for something to break while I toiled away on something far removed from my goals. 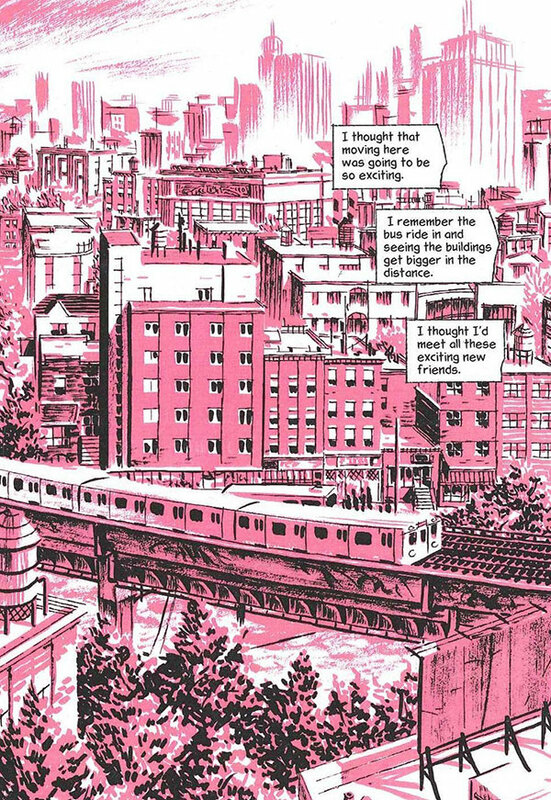 A selection of pages from Shoplifter depicting the isolation of big city life. Shoplifter can also be read as a critique on and rebellion against consumption society and the shallowness of marketing and advertising. Is that something you contemplate on, that consumerism and the rapid pace it brings with it, makes us focus on the wrong things in life? I do think about advertising and marketing and its impact on people. But more importantly, one of the things I was trying to get across in Shoplifter is the possibility of hope and connection with people in unexpected places. While we have many interesting new avenues for meeting people these days (social media, etc.) they still don’t remedy the alienation that some people feel, and in some ways they fuel it. We sometimes edit ourselves for consumption via social media, for example, building ideal projections of our lives to sell to others. But as new systems pave over old ones, some interesting cracks appear through which we can still make that unexpected human connection. Your heavy use of pink is interesting since in color theory, pink is considered energetic, stimulating and expressing joy, which directly opposes the themes you’re exploring. Why did you decide to use the color? I initially chose it because it was a color that wasn’t being used much at the time. A lot of books that are two-toned are either blue or turquoise or yellow. So I wanted to pick a color that stood out and was different. But when I started testing it out, I realized it also fit the intimate feel of the story well. And, as you mentioned, the pink juxtaposed and counterbalanced the subject matter, preventing it from getting morose or dreary. I was happy with the choice. 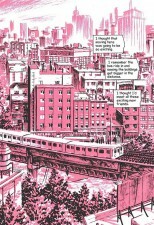 You’ve said that this book is the first in a series of ‘connected’ graphic novels. Yes, Shoplifter is the first of five planned books that are connected. They all feature different characters and settings and are meant to be read as stand-alone stories, but by the fifth book, the connection between the characters becomes clear. I’m already slowly working on number two and like Shoplifter, it’s a stop and start process that eventually gains momentum. Does your decision to play the card of real-world storytelling mean it’s the genre you’re most comfortable with? Or could you see yourself venturing into other genres, like you did last year with your short with Chip Kidd in Batman: Black and White? 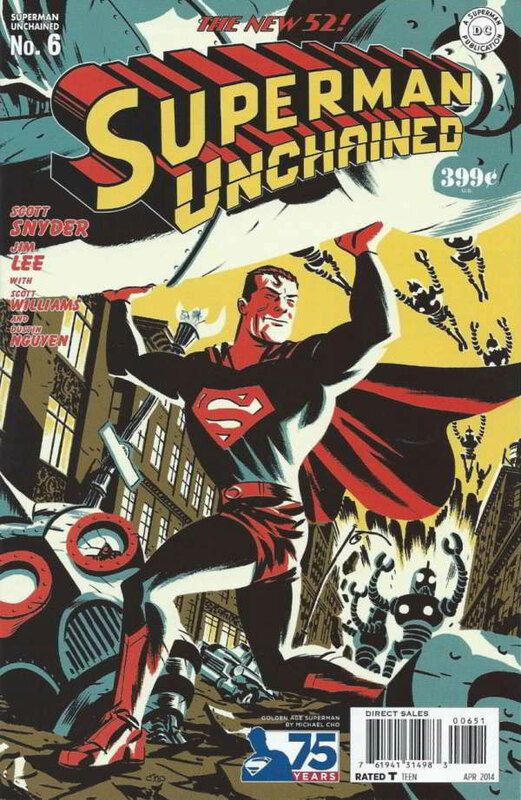 Michael Cho’s Golden Age variant cover for Superman Unchained #6. I read and like all kinds of comics. I view comics as a medium, not a genre, so I have a desire to tell a variety of stories. And my approach is different depending on the story I want to tell. It’s funny but when I’m deep into working on something like Shoplifter, which is very grounded, I feel the desire to take a break afterwards and do something completely different, like a crazy all-out action story. I might do something short in another genre, but to do anything as long as a graphic novel really requires me to commit and believe wholeheartedly in what I’m doing and right now that means doing more personal and intimate stories. I’m not sure what the future holds, but that’s where my muse is leading me now. 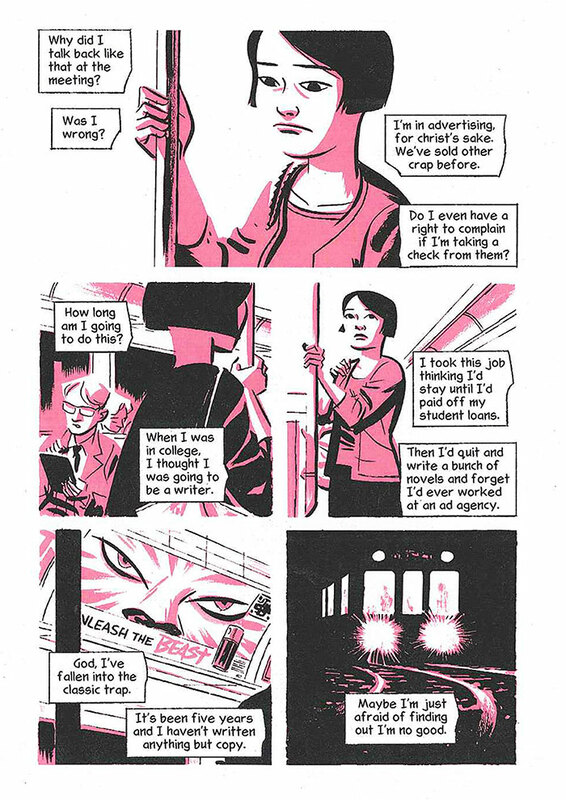 Michael Cho’s Shoplifter is available now from Pantheon/Jonathan Cape for $19.95. Great interview with a new and promising creator!